Your satisfaction is our priority! Come and enjoy a relaxing moment with our teams in a tranquil, pleasant setting! Paris is just a short distance away for a romantic weekend or family break. Reserve a room online and join us soon! 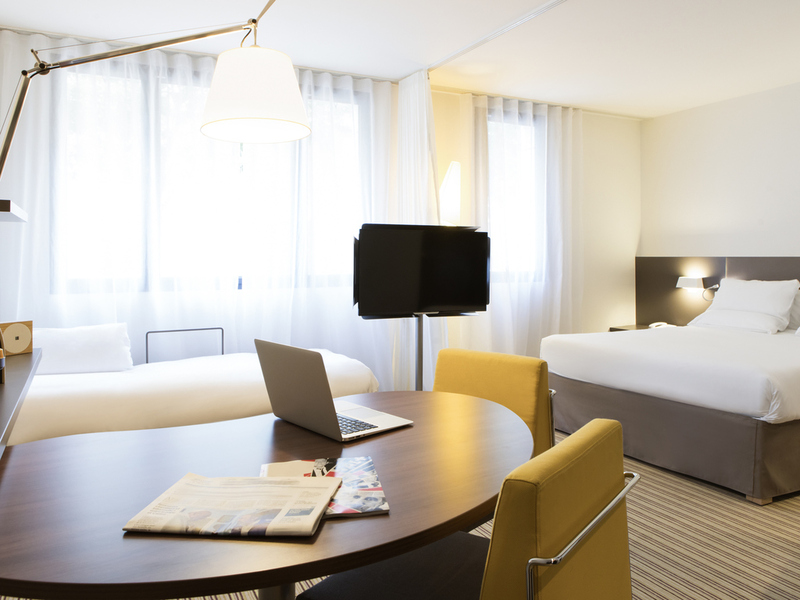 In the heart of the Rueil-sur-Seine business district, let yourself be seduced by the Novotel Suites Paris Rueil Malmaison. This 4-star hotel offers modern and spacious Suites measuring 323 sq. ft. (30 m²), with free high-speed WIFI and TV package (Canal+, beIN). Enjoy dishes in the dining area or in your suite. Keep fit in the fitness center or take a walk on the banks of the Seine. Discover Rueil-Malmaison in a new light at Novotel Suites. Enjoy a selection of cold drinks, fruit juices, wines and aperitifs and take the time to relax with your family or friends in a warm and cozy atmosphere at the Novotel Suites bar. Check in and Check out were good. The only thing is, if there is someone in front of you it takes very long time until you are served. The staff is friendly and my needs were met. Overall my stay was pleasant. The cleaning of my room was not thorough. It was straightened up each day but not really cleaned. I also would have appreciated having an iron and board within my room. As a female traveling alone, it did not feel safe going to a room with a closed door to iron a shirt where another person had access to come in and possibly attack me without being seen. If the iron is going to be shared amongst all guests in the hotel it should be in an open space or the door should be removed. Past reviews said the staff were rude but I found them nearly all to be very friendly. Cindy was always cheerful and helpful. We loved the breakfast. Bits of the hotel are falling off though. Railing in the lift etc. I have always liked the design and layout of Novotel Suites hotels in all cities. Airy, nice soft curves. Same experience in Rueil Malmaison this time. Room a bit noisy (not far from highway). Breakfast area very busy in the morning. M. A., Thank you very much for your comment. We are really pleased to see that you enjoyed your stay especially the comfort of the room. We hope to see you soon, The reception team. Monsieur C., Merci pour votre commentaire ! Nous sommes actuellement en train de mettre en place une rénovation de certaines moquettes de l'établissement. N'hésitez pas à partager directement avec nous vos avis lors de vos prochains séjours. A bientôt, L'équipe de réception. It was a flying stop and didn't spend much time in the room except to sleep as I was meeting a friend who was leading a group of students from Canada. This was the reason I stayed in this hotel. The staff were great but I wouldn't choose this hotel again as it was expensive for what it was. Very nice! We were very happy with our stay. I am a platinum card holder who stays for multiple weeks at the same hotel through the year. Unlike when I visit other hotels in the group where I receive an extremely warm welcome typically receiving a welcoming letter from the manager and a small gift I typically get a polite and vaguely friendly reception but far from warm welcome. On this trip, I arrived at 8am early in the morning after flying on an overnight flight; tired and dirty. I was greeted by a young, male receptionist I had never seen before who I assume was a temporary or new hire. I wasn't able to log in to the hotel booking system because he had the wrong password. He tried 3 times without success and then announced. &quot;You are too early so you can't check in until 2 but you can leave your bags &quot; without ever bothering to actually check if any rooms were available. To tired to bother complaining I did so and went to work. When I returned I was given a room with a box of biscuits from the hotel lobby store placed on the rooms table without any explanation. The hotel is well located for my work but the entire experience left me feeling highly disappointed, taken for granted and far from a valued customer of the group. Enjoyed overall. However I find that the person who welcomed me was not very friendly and kind. Lovely as always. Everything you need on a business trip. Brief but pleasant. Staff are always friendly, rooms are just right. My shower got flooded, and I learned it was the one under fixing. To me this hotel is worth 80 euros, not 170, even in Paris/Rueil. On top, I had to pay breakfast... and the Food-in-Hotel from Monopris is awfully expensive. My multinational employer is paying, but for the first time in my life I'm ashamed to get them to pay for this. The Novotel suite image is very damage to me. Next time I take AirBnB and pay myself a nice dinner. Personnel was nice and doing what they should, but it's not high standard servicing for sure. Pure robbery. Paris pricing is ridiculous. Everything is fine, except one issue. I saw a mouse on the first floor and was very disappointed.